A little bit of gameplay footage has been released from the upcoming brawler Teenage Mutant Ninja Turtles: Out of the Shadows, complete with commentary from some of IGN's finest. The game is still in pre-alpha but is coming along quite nicely, sporting a visual style that leans closer to the modern incarnation of the TMNT crew but with gameplay geared towards those who grew up with the original turtles, a.k.a. the only real TMNT. That's right, we said it. Some of the best co-op brawling experiences from the arcade, NES and SNES eras happened to be ninja turtle-related, including Teenage Mutant Ninja Turtles: Turtles in Time and Teenage Mutant Ninja Turtles: The Arcade Game. We all remember how awesome it was throwing Foot Soldiers directly into the screen. Out of the Shadows is going for a taste of that experience with turtle-specific playing styles and team-based moves, meaning your co-op buddies will have to do a little more than just hit buttons and hope for a win. 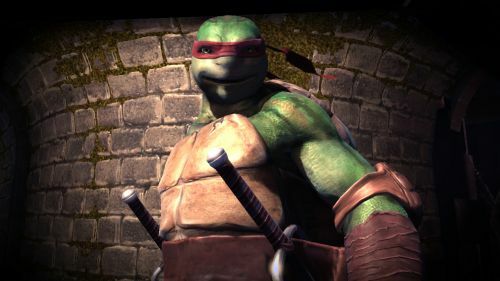 Teenage Mutant Ninja Turtles: Out of the Shadows is scheduled for release this summer on Steam, Xbox Live Arcade, and PlayStation Network. It will support two player local and four player online co-op. Page created in 0.3548 seconds.